Car accidents are one of the leading causes of injury in the United States. Injuries caused by vehicle collisions can range from broken bones and contusions to traumatic brain injury and other catastrophic or permanently disabling afflictions. West Virginia civil law provides victims of car accidents the opportunity to pursue compensation from the at-fault driver to pay for medical bills, lost wages, and even the pain and suffering associated with your experience. Pursuing these claims, however, requires the assistance of an experienced West Virginia car accident lawyer. The West Virginia car accident attorneys at the Manchin Injury Law Group, PLLC have been assisting victims of automotive collisions in Fairmont for 37 years. We set ourselves apart by treating every client like family – when you walk into our office, you can rest assured knowing that we will treat you with both dignity and compassion. Our lawyers also give your case the seriousness and dedication it deserves. We prepare every single case as if it’s going to trial – we gather evidence, conduct an independent investigation into the crash, use forensics, and gather eyewitness statements to help your case. While many of our cases settle out of court, we’re always prepared to fight for your rights in the courtroom. Contact our Fairmont office to schedule a free case evaluation and see how we can help. Why Do Car Accidents Happen in West Virginia? What You Can Do to Avoid a Car Accident? You might not understand your right to full compensation under the law. There are a number of different damages you may be able to collect following a car crash. While you might just think you’re entitled to compensation for your medical bills, you may also be able to recover your lost wage and even reimbursement for your pain and suffering. Should a car accident lead to your incapacity, your family members may be able to collect compensation to pay for your ongoing medical expenses, as well. Insurance companies might try to take advantage of you. Most insurance companies are familiar with the complex rules that govern car accidents, and you may not fully understand them. They are also committed to paying out as little on a claim as possible. As a result, they may take advantage of your lack of knowledge regarding your claim and give you a low-ball offer. An experienced West Virginia personal injury attorney knows how much your claim is really worth and will negotiate aggressively on your behalf to obtain the full cost of your bills, lost wages, and suffering. Car accident liability is complex. In West Virginia, there are certain rules that determine fault, and dictate what happens when multiple parties play a role in an accident. Since there are so many elements that play into a car accident case, having a West Virginia personal injury attorney to protect your rights is essential. An attorney can help you understand your rights. Insurance companies often try to settle out of court, as this is the less costly option. However, you always have the option of taking your case to court and letting a jury award damages in your case. The West Virginina car accident attorneys at the Manchin Injury Law Group, PLLC prepare your case as if it could go to trial, which may result in the insurance company countering with a fair offer. You need to follow certain rules and procedures. West Virginia law requires that anyone seeking to file a personal injury lawsuit follow certain filing procedures and time limits. If you don’t adhere to these regulations, you may lose your right to sue and will never be able to gain compensation from the at-fault party again. To avoid this disastrous scenario, we recommend scheduling a free initial consultation with our experienced West Virginia car accident lawyers as soon as possible following a car collision and avoid making these common mistakes. After sustaining injuries in a car accident in West Virginia, your first step is filing an insurance claim with the at-fault driver. Their insurance company will investigate the claim, make a designation of fault, and offer you a settlement. This is often where an attorney’s guidance becomes essential, as he or she will negotiate on your behalf to receive a fair settlement for your medical bills, lost wages, pain, and suffering. If you and the insurer cannot decide on a settlement amount, you may have to go to trial and have a civil jury decide. This process varies from case to case, but settling a car accident claim can take anywhere from a few months to a few years. It depends on the number of vehicles involved, the extent of the injuries, and whether other motorists share fault for an accident. The state civil code of West Virginia sets certain time limits for bringing a lawsuit for personal injury. That time limit is two years. If you fail to file a claim within two years of an accident, you may lose your right to compensation. For this reason and many others, contact a West Virginia car accident lawyer for a free initial consultation as soon as possible. The Manchin Injury Law Group, PLLC is here to help you understand your rights as a victim of negligence following a car accident. To schedule a free initial consultation with our firm and attain a review of your legal options, please contact us. Economic damages, which include the cost of your medical bills and property damage, any loss in earning capacity, and the costs of your ongoing treatment or therapy. General damages, which address the intangible losses of your accident. These include loss in life quality, pain, and emotional anguish. $25,000 per crash involving one injury (personal injury). $50,000 per crash, involving two or more injuries. If your injury damages extend beyond this minimum amount, and the at-fault driver only has this coverage, you may be able to obtain the rest of your compensation from your underinsured motorist coverage or the at-fault driver ’s personal assets . West Virginia is a state with scenic views that hundreds of thousands of people travel on each year. There are 37,277 miles of public roads and 549 miles of interstate highways. There are currently around 795,000 cars registered throughout the state, with 580,000 light trucks and 10,000 heavy trucks. We also have a lot of motorcycle travelers, with 26,000 registered in the state. 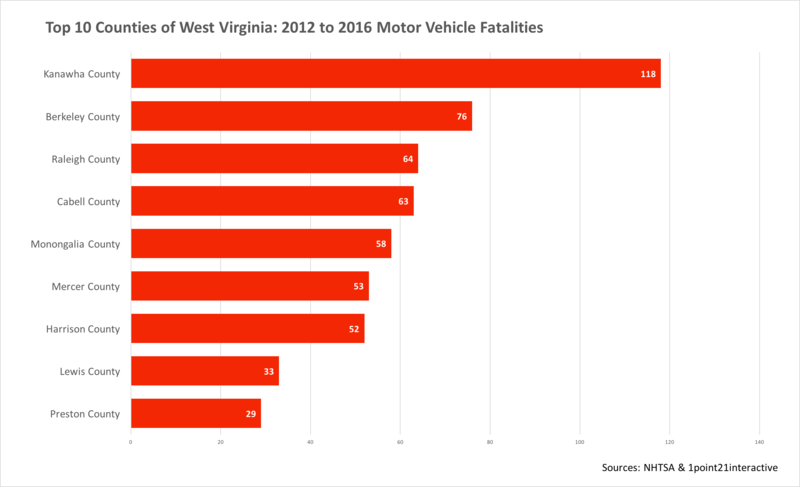 In 2016, there were 186 recorded fatalities due to West Virginia car accidents. Although deaths have consistently decreased since 2006, car accidents are still one of the most common causes of death. Of these deaths, 80 people were unrestrained, compared to the 72 who were wearing seatbelts or other restraining devices. Restraint use was undetermined in 34 cases. Nearly a quarter of all fatal accidents in the state involve alcohol use. The most common causes of fatal car accidents involve roadway departure, rollover, and single vehicle accidents. Rear-end accidents. These accidents usually occur when someone fails to assure a safe following distance and crashes into another vehicle. This may have a domino effect at high speeds, and whiplash is one of the most common injuries reported in rear-end collisions. Side impact collisions. People may know these as “t-boning” or “broadsiding.” These accidents often occur at intersections. Both property damage and injuries are more likely to be severe in these accidents. Rollover. Vehicle rollover is most likely to occur in single-vehicle accidents, and at high speeds. SUVs are more prone to this type of accident because of their higher center of gravity. Head on collisions. When the two front ends of vehicle collide, the results can be disastrous. These collisions can often be fatal, especially at high speeds. Sideswiping. These accidents occur when two parallel vehicles touch one another, and it’s more common on interstate highways. At slow speeds, damage is usually limited to property, but high-speed collisions can result in serious injury. Pileups. These accidents involve multiple vehicles, and it’s not uncommon for several parties to share fault. Whiplash. This soft tissue injury occurs when the force of a crash causes a driver or passenger’s head to “whip” backward. The force of the crash may also cause trauma to the skull from striking the steering wheel or back seat. Broken bones. Fractures can be simple or complex, and may even require surgery. Traumatic brain injury. Concussions are the most common form of traumatic brain injury, and car accidents are the second leading cause of all brain injuries nationwide. Spinal cord injury. The force of a crash can cause trauma to the neck or spinal cord, which can lead to paralysis, loss of sensation, or other loss of bodily function. Unsurprisingly, speeding is one of the most common causes of car accidents. West Virginia is home to scenic, winding roads – which can become deadly when there’s a speeding driver in the other lane. Even going a few miles over the speed limit can exponentially increase your likelihood of being in a crash – as well as sustaining serious or life-threatening injuries. According to the National Highway Traffic Safety Administration, reading a text takes about 5 seconds. Traveling at speeds of 55 miles per hour, you could travel the length of a football field during this time – all while not paying attention to your surroundings. Drunk driving claims thousands of lives and leads to even more injuries each year. Drivers who get behind the wheel after drinking or using drugs commit gross negligence that can have serious consequences. Operating under the influence does not apply to just illegal drugs or alcohol – even people who take prescription medications that alter their judgment may be guilty of negligence if they cause a crash. West Virginia sees its fair share of inclement weather, from ice and snow to freezing rain and torrential storms. Even high winds can cause car accidents by impacting a car’s control. Inclement weather conditions are a common cause of West Virginia car accidents . There’s always some risk of being in a car accident, even if you control as many factors as possible. Wearing a seat belt is one of the simplest ways you can reduce your risk of serious injury, even if you are in an unavoidable car crash. Statistically, some driving times are safer than others. According to the National Highway Traffic Safety Administration, accidents are most common between 3-6 p.m. on a weekday – evening rush hour. If you can’t avoid driving during these times, at least use extra caution. Also avoid driving during the late night hours, when you’re most likely to encounter a drunk driver. Resist the temptation to talk on the phone, text, or otherwise fiddle with your mobile device. Hand it to a passenger to manage, or put it in your glove box. If you must take a call or check your map function for directions, pull over to the side of the road and do it there. If you’re a parent to a teenage driver, enforce a strict “phone off while driving” rule, and keep them accountable by downloading a usage and tracking app. Practicing basic safety and defensive driving techniques can greatly reduce your risk of being in an accident, but cannot eliminate it completely. If you or a loved one sustained injuries in an accident involving a negligent driver in West Virginia, consider speaking with a qualified Fairmont car accident attorney.